A good visual makes a blog post more appealing. A funny visual boosts traffic. Best visual of all: one that prompts readers to share the post with their friends and/or associates. Here’s a spot illustration I did for a post about press conferences. 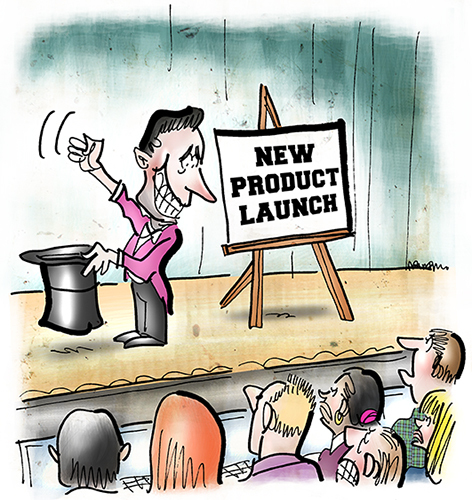 The author’s contention: hi-tech companies often call press conferences to announce a new product release, then leak the information to selected media outlets before the press conference. Result: tech journalists attend the conference only to discover they’re getting the “news” secondhand, and that a competitor has already published the information. They’re understandably resentful, and have little incentive to help publicize the company’s new product. My take: the magician can’t pull a rabbit out of his hat because the rabbit’s long gone. What do you think? Are you more inclined to read a blog post that has some visuals? Have you ever “liked” or shared a post because an image made you laugh? Hope you’ll leave a comment. Without doubt, I think a good visual does make a blog more appealing. I love your original artwork in this blog and I have clicked the “like” button on your posts from time to time. Thanks, TT. I appreciate the Likes and your very kind support. A great visual is a magnet that attracts people to your site/product. (Love yours by the way.) The visuals and the content, when they work together, are real crowd pleasers. Keep up the good work. I think you make a very essential point, Judy: the visuals and the content have to be in sync. Posts with unrelated stock photos send a confusing signal which hurts their credibility. Definitely agree. I know several posters who attract my eye and I cannot resist their blogs. I worry about clutter so I keep my blog sparse, but I worry it’s too cold and boring sometimes. One of the blogs I followed had this cartoon. I nearly died laughing and had to repost the whole backstory because it was so great. Good to see you, Amelie, and thanks for sharing the cartoon! Mark, I don’t believe that this is a simple question to answer. So many contingencies are involved however; in this time-short world a good pic and a funny caption seem to capture more audiences than a long amount of comment… My blog, unfortunately, is not made of such themes…. The right visual can add power to text, however, and help establish a mood, and an emotional connection. That’s the great power of a visual. True, and yet the same could be said in reverse…! All depends upon the author and topic…. No doubt about visuals capturing mood, etc., however, I believe that it’s still in the hands of the author as to whether his content/intention will reach his public in a fashion that will outlast the meteoric rise that came from splashes of pictures and imagery… for their sake…! Well said, Carolyn. A great visual won’t save bad writing or a poor idea. The same holds true within visual art itself, actually. It might surprise people to know that cartooning and illustration both require good writing. Sometimes it’s a cartoon caption: struggling to find just the right word combination, pacing, etc. Illustrations don’t have captions but they need to be well thought out. You need a strong concept, a clear idea. You “write out” your idea by doing a rough sketch, working out all the visual elements. Then you can proceed with confidence because you know what you want to say. You do both the imagery of writing and the wording of writing so very well…. I love that magician! He’s still selling it no matter what! You can practically see the sweat beading on his forehead. And I would have to say that visuals are so important. YAY for escaping bunneeeez!!!! Who wants to live in a hat? Well, maybe The Old Woman Who Lived In A Shoe. It might seem upscale to her…LOL…but seriously……your illustration is terrific! Lots of action and right to the point! I love posts with pictures, especially for those posts in that tinytinytiny print that only 12 year olds can see. Then I can skip the reading and comment on the image. Whoa. Did I just say that out loud!!?????? Huh?? Did I just confess to being the only kid ever sent home for having 5 o’clock shadow?? Ahahahaha…very useful and amusing writing at the same time! Love it! I like to read a blog post that has some visuals but I don’t think so I am more inclined to do so. It depends on what I look for to read.